All six locos can be seen in this shot. Enthusiastic crowds were very much in evidence. On 3 July 1938, A4 locomotive Mallard raced down Stoke Bank at 126mph to set a new steam locomotive world speed record. 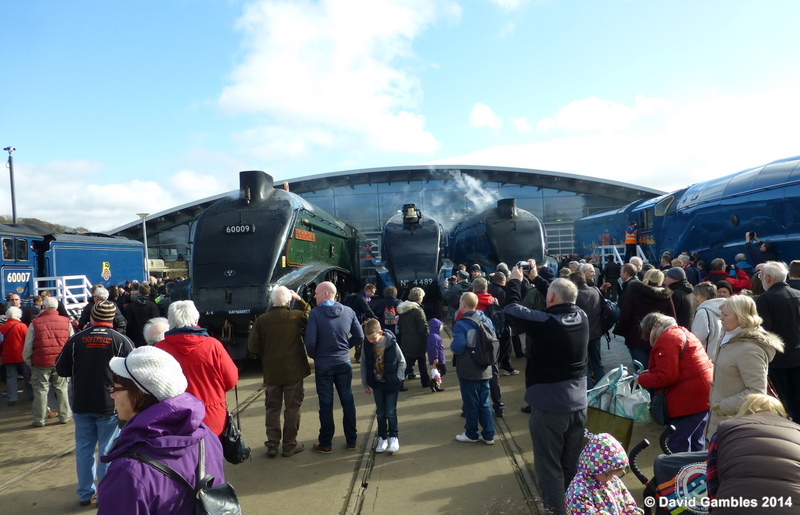 The NRM has been marking the 75th anniversary of this with a series of commemorative events that commenced last year and now the six locomotives have been brought together for the 'Great Goodbye' event at Shildon NRM in Co Durham. Two of the engines, Dwight D Eisenhower and Dominion of Canada are on loan from American and Canadian museums. 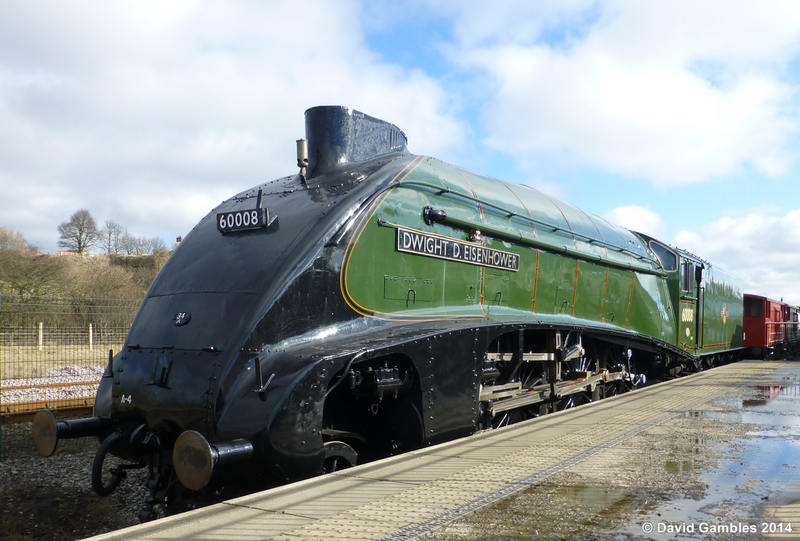 Dominion of Canada and Dwight D Eisenhower returned to the UK in October 2012 after a challenging extraction from their home museums, an epic transcontinental trek by rail across North America and a 2,527 mile journey across the Atlantic. Now the six survivors from the class of 35 are appearing together for the last time before the overseas based examples return home across the Atlantic. The A4's were designed in the 1930's by Sir Nigel Gresley for use by the LNER on the East Coast main line. I well remember standing on the southern end of Doncaster station platform in the early 1960's and hearing shouting and cheers from the northern end of the station announcing the arrival of an express being pulled by an A4. It would race through the station and make a fine sight as it did so and if its chime whistle was blown that would complete the scene. 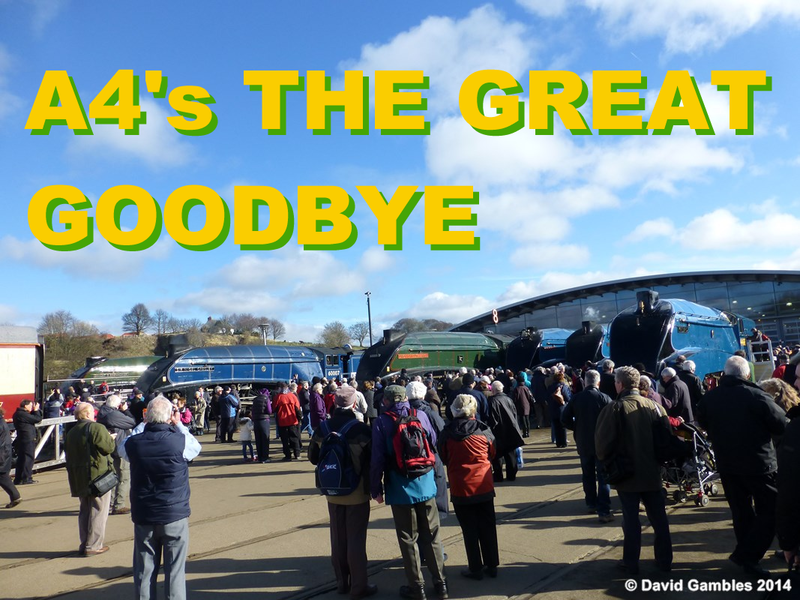 The shouting and cheers were reserved for the A4's, no other loco would receive such a welcome. It is amazing that six examples have survived and it was a privilege to see them together before they are separated again. I resigned myself to only having brief glimpses of the locos and told myself that I would have to be tolerant of the crowds that would be in attendance. After all it was half term and everyone would want to see them. Sure enough, when I arrived I joined a 25 minute queue to enter the museum, but it seemed to move well and we soon came withing view of the display area. engines weren't exactly in line making it difficult to get the shot of all six together. Why, well maybe it's all part of making money out of the event, so only those that pay for a special viewing get to see them in line. Right or wrong - you decide! 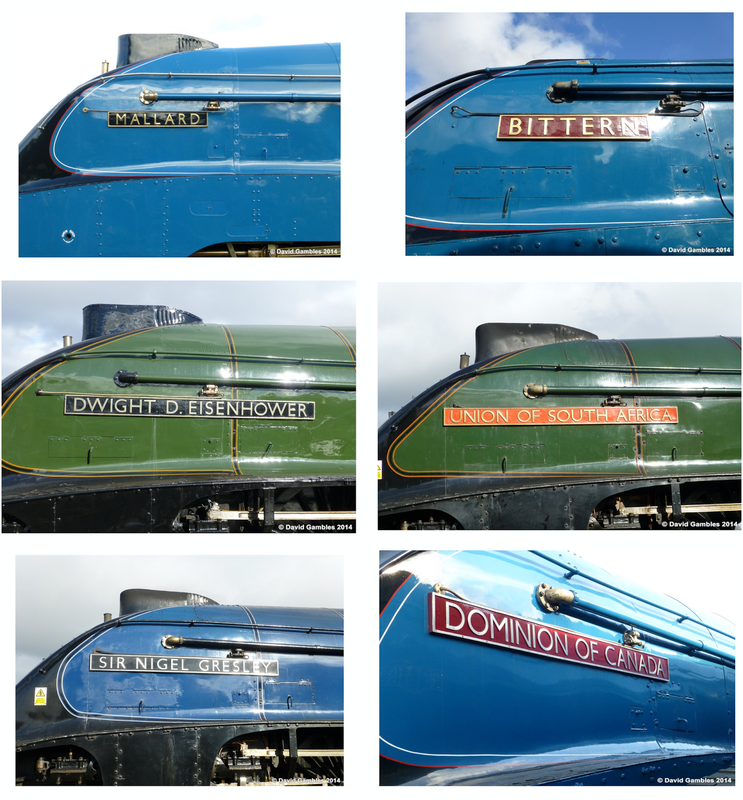 The six locos will be on display at Shildon until 23rd February. A view from the nearby road bridge showing the busy scene. The main line serving Shildon is on the left.